Emperor Go-Murakami (後村上天皇, Go-Murakami-tennō) (1328 – March 29, 1368) was the 97th emperor of Japan, according to the traditional order of succession, and a member of the Southern Court during the Nanboku-chō period of rival courts. He reigned from September 18, 1339, until March 29, 1368 (Shōhei 23, 11th day of the 3rd month). His personal name was Noriyoshi (義良). He reigned from Sumiyoshi, Ōsaka, Yoshino, Nara, and other temporary locations. 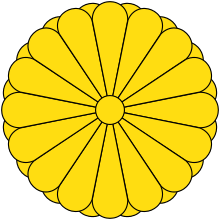 This 14th-century sovereign was named after the 10th-century Emperor Murakami and go- (後), translates as "later"; and thus, he is sometimes called the "Later Emperor Murakami". The Japanese word go has also been translated to mean the "second one"; and in some older sources, this emperor may be identified as "Murakami, the second", or as "Murakami II". He lived during the turbulent years of conflict between rival claimants to the Chrysanthemum Throne. The contested succession pitted what were known as the Northern and Southern Courts against each other. These years are also known as the Nanboku-chō period. When Emperor Go-Daigo began his Kenmu Restoration, the still very young prince, along with Kitabatake Akiie, in 1333 went to Tagajō in what is now Miyagi Prefecture, at the time Mutsu Province, to return the eastern samurai to their allegiance and destroy the remnants of the Hōjō clan. However, in 1336, because Ashikaga Takauji had raised a rebellion, the Emperor returned to Sakamoto with a strong force to confront him. In 1348, Kō no Moronao attacked Yoshino, and the Emperor left for modern-day Nishiyoshino Village in Yoshino District, Nara Prefecture, which was then Yamato Province. In 1352, he entered Otokoyama in Yamashiro Province. As a result of the Battle of Shichijō Ōmiya, Kusunoki Masanori recovered Kyōto from Ashikaga Yoshiakira. 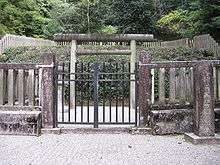 The Emperor and his retinue were confined to Otokoyama, but escaped to Kawachi Province during an attack by Yoshiakira, and a few months later returned to Yoshino. They continued trying to recover Kyōto, but the Southern Court's power was already weakening, and by the Emperor's death in 1368, Ashikaga Yoshimitsu was in power and the throne had been moved to Sumiyoshi. Go-Murakami's tomb is known as Hinoo no misasagi (檜尾陵); it is located in the precincts of Kanshin-ji temple (観心寺) in Kawachinagano, Osaka. The years of Go-Murakami's reign are more specifically identified by more than one era name or nengō. ↑ Ponsonby-Fane, Richard. (1959). The Imperial House of Japan, p. 158. 1 2 3 4 5 6 Sansom, George (1961). A History of Japan, 1334–1615. Stanford University Press. p. 32,43. ISBN 0804705259. Ponsonby-Fane, Richard Arthur Brabazon (1959). 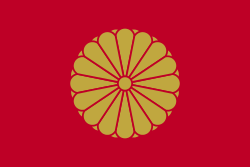 The Imperial House of Japan. Kyoto: Ponsonby Memorial Society. OCLC 194887. Titsingh, Isaac, ed. (1834). [Siyun-sai Rin-siyo/Hayashi Gahō, 1652], Nipon o daï itsi ran; ou, Annales des empereurs du Japon. Paris: Oriental Translation Fund of Great Britain and Ireland. OCLC 251800045.